In the Name of God Amen. I William Gibbs of Winslow in the County of Bucks Glover being sick and weak in Body but of sound and disposing Mind and Memory (for which I bless God) do this sixteenth day of August in the year of our Lord One Thousand seven hundred and Eighty nine make and ordain this my last Will and Testament in manner following (that is to say) First I will that all such Debts as I shall justly owe at the time of my decease and my funeral Charges and Expences be in the first place paid by my Executor hereinafter named and as to my Estate both real and personal I dispose thereof in manner following (that is to say) First I give and bequeath unto my four Nieces Ann the wife of Thomas Morecraft of Winslow aforesaid Butcher Mary Gibbs Elizabeth Gibbs and Penelope Gibbs Daughters of my Brother John Gibbs the Legacy or Sum of five pounds each of lawful money of Great Britain. 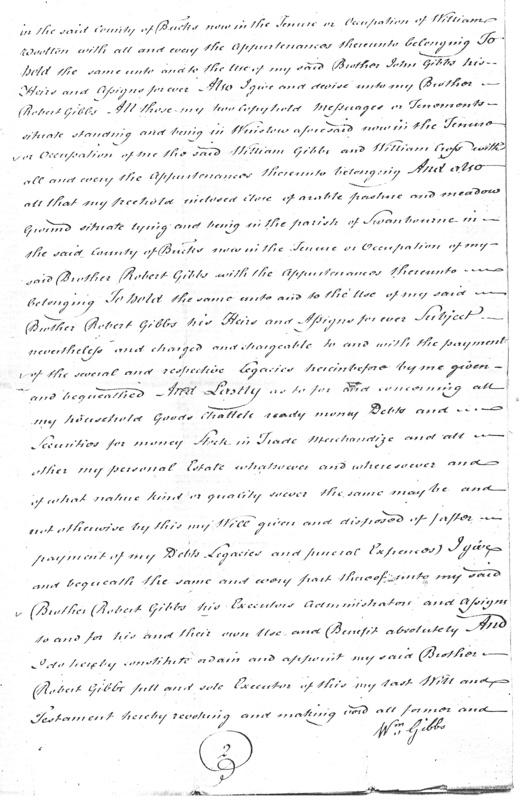 Also I give and bequeath unto my Nephew John Gibbs the Son of my said Brother John Gibbs the Legacy or Sum of five pounds of like money. 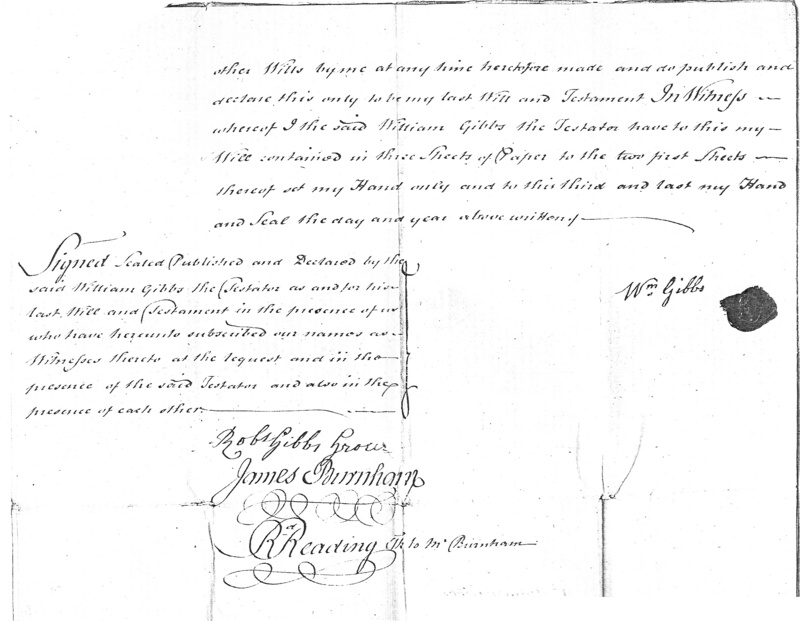 Also I give and bequeath unto my Brother Thomas Gibbs and to his four Children William Gibbs John Gibbs Jane the wife of Thomas Matthews and Elizabeth the wife of John Gibbs the Legacy or Sum of five pounds each of like money. Also I give and bequeath unto my Servant Hannah Dumbleton otherwise Westmucket the Legacy or Sum of twenty pounds of like money. All which said several and respective Legacies or Sums of money hereinbefore by me bequeathed I do hereby order and direct to be paid to my said several and respective Legatees within twelve Calendar months next after my decease. 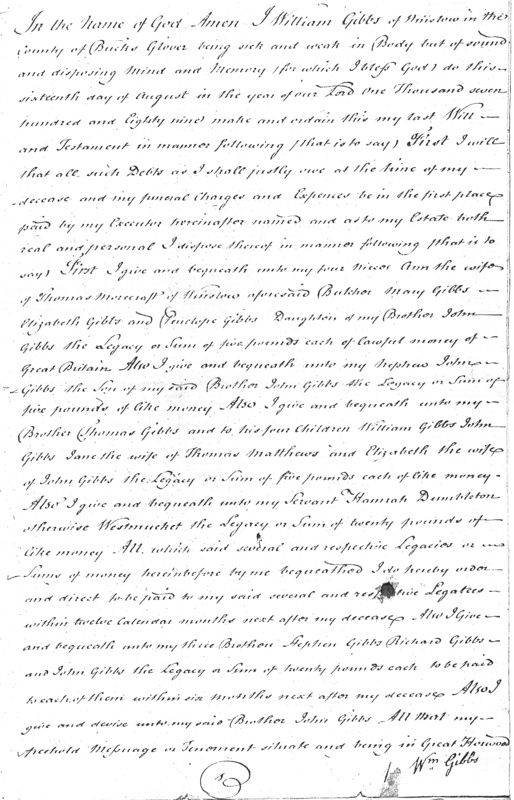 Also I Give and bequeath unto my three Brothers Stephen Gibbs Richard Gibbs and John Gibbs the Legacy or Sum of twenty pounds each to be paid to each of them within six months next after my decease. Also I give and devise unto my said Brother John Gibbs All that my freehold Messuage or Tenement situate and being in Great Horwood [page 2] in the said County of Bucks now in the Tenure or Occupation of William Wootton with all and every the Appurtenances thereunto belonging To hold the same unto and to the Use of my said Brother John Gibbs his Heirs and Assigns for ever. Also I give and devise unto my Brother Robert Gibbs All those my two copyhold Messuages or Tenements situate standing and being in Winslow aforesaid now in the Tenure or Occupation of me the said William Gibbs and William Cross with all and every the Appurtenances thereunto belonging And also all that my freehold inclosed Close of arable pasture and meadow Ground situate lying and being in the parish of Swanbourne in the said County of Bucks now in the Tenure or Occupation of my said Brother Robert Gibbs with the Appurtenances thereunto belonging To hold the same unto and to the Use of my said Brother Robert Gibbs his Heirs and Assigns for ever Subject nevertheless and charged and chargeable to and with the payment of the several and respective Legacies hereinbefore by me given and bequeathed. And Lastly as to for and concerning all my household Goods Chattels ready money Debts and Securities for money Stock in Trade Merchandize and all other my personal Estate whatsoever and wheresoever and of what nature kind or quality soever the same may be and not otherwise by this my Will given and disposed of (after payment of my Debts Legacies and funeral Expenses) I give and bequeath the same and every part thereof unto my said Brother Robert Gibbs his Executors Administrators and Assigns to and for his and their own Use and Benefit absolutely And I do hereby constitute ordain and appoint my said Brother Robert Gibbs full and sole Executor of this my last Will and Testament hereby revoking and making void all former and [page 3] other Wills by me at any time heretofore made and do publish and declare this only to be my last Will and Testament In Witness whereof I the said William Gibbs the Testator have to this my Will contained in three Sheets of Paper to the two first Sheets thereof set my Hand only and to this third and last my Hand and Seal the day and year above written. Signed Sealed Published and Declared by the said William Gibbs the Testator as and for his last Will and Testament in the presence of us who have hereunto subscribed our names as Witnesses thereto at the request and in the presence of the said Testator and also in the presence of each other.